Hi, I'm a user that plans on migrating from Quartz Composer basically as soon as it's possible. I've been excited for Vuo a long time, and I appreciate both the scope of the Vuo project and the distance it's come since it was first announced. Right now, a number of projects I've done with Quartz Composer leaned heavily on the combination of Iterator & Image Pixel patches. It's gotten harder to work with as time goes on, however, so I find myself fighting crashes and slowdown whenever I want to revisit old projects. I understand that the roadmap has the basic/advanced iterator behavior covered, so I'd like to request the implementation of a patch equivalent to Image Pixel. This project (http://cargo.andrewohlmann.com/Fake-Math) basically had little Tron-style drivers that left walls behind them and used the 'image pixel' patch to look a pixel ahead, detect where the next wall was, and initiate a turn. This project (http://cargo.andrewohlmann.com/QC-Painter) used random individual pixels as triggers for sprite-based brushes. While I use it individually or in iterators to generate grids (another example: https://vimeo.com/15940273 ), I could also see it be used more programmatically, as in "find the brightest spot in this image". Sample radius — used to crop a subsection of the image extending equally from the X/Y coordinates, average all colors inside it, and return the average color of that sample area. A value of 1 would crop, average, and sample a 3x3 pixel grid of the image, with the XY coordinate pixel in the center cell. Output color type — Native color, or segregated HSL, RGB, HSV, CMYK[? ], alpha values. 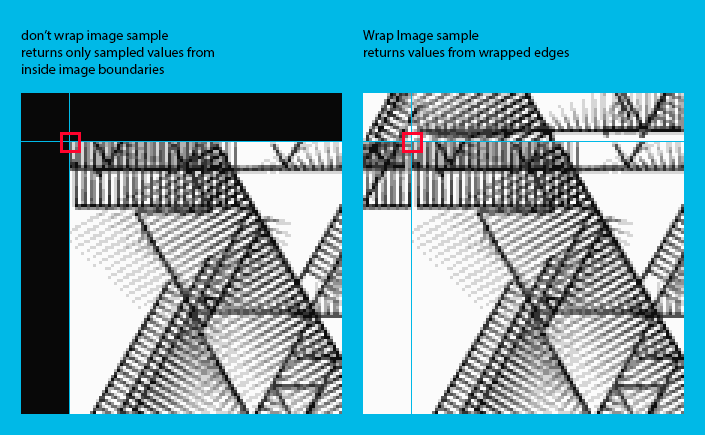 Wrap image edge — When I sample an area with a radius of 2 in the top left corner, do I want to limit my sample to a 3x3 grid in the top left, or do I want to grab the 2 pixels from the other edges? See attached mockup. Thanks for taking the time to read and consider this request. Thanks for suggesting this. We've opened it up for pledging. In Vuo 1.1, we added the Sample Color from Image node. It outputs a VuoColor, which you can then feed to Get HSL Color Values if you like. We haven't implemented wrapping yet; I branched another feature request for wrapping.